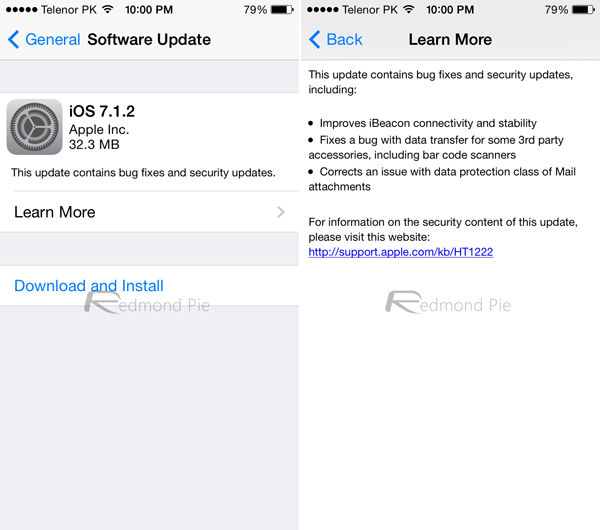 iOS 7.1.2 download links are now live for iPhone, iPad, iPod touch, fixing a bug pertaining to the encryption of email attachments and iMessage delivery. Additionally, a further lock screen-related bug has also been dealt with, and so if you’re running iOS 7.1.1 on your iPhone, iPad or iPod touch, it is highly recommended that you download the update right away. The email attachments encryption bug first came to light a few months back, with security expert Andreas Kurtz having demoed the issue by means of a YouTube clip, and given how swiftly Apple tends to react in these situations, it’s quite surprising that the remedial update of iOS 7.1.2 has taken so long to manifest. Having lingered in Apple’s software since iOS 7.0.x, the encryption of email attachments bug was patched by means of a jailbreak tweak that gave jailbroken device owners a permanent solution, but for those who haven’t consulted the powers offered by Evasi0n7, help is now finally at hand. As can be seen in the changelog above, Apple has also added fixes for iBeacon and 3rd party accessory related bugs, so if you are not jailbroken, it’s well worth grabbing this update for your iPhone or iPad. Even though you can pick this update up over-the-air using the Software Update feature found within the Settings app, we always recommend connecting to iTunes and going about it the traditional way. If you absolutely cannot connect to a PC or Mac, then so be it, but in our own experience, it seems that docked updating is less temperamental, or likely to throw up problems later in the day. Be sure to grab the latest iOS 7.1.2 update for your iOS device, and once installed, let us know if you spot anything interesting by dropping a comment below. help, i need to know if i still can downgrade from 8.0.2 to 7.1.2? When I restore MY iPHONE 4s, iOS 7.1.2 From iOS 8.02..I face this error ” The Iphone “____” couldn’t be restored because the firmware file is not compatible …..
Can u tell me any solution ?? i downloaded this and i really don’t like it so how do i delete this off my mac computer? To delete the file off your computer? I run Windows but if you can find your ‘downloads’ folder or equivalent you can find the file there. I’m unsure if you can delete it off your iOS device. When I restore MY iPHONE 3 WIFI, iOS 7.1.2 From iOS 8.02..I face this error ” The Iphone couldn’t be restored because the firmware file is not compatible ….. I can’t find it. I only have iTunes Store on my iphone. Please help me. 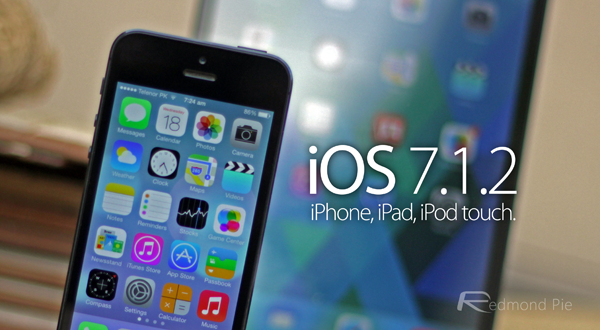 quick question to the experts> I am currently running IOS 7.0.3 on my 4s. and since I updated through OTA I am unable to jailbreak it. can I still upgrade to 7.1.2 by above method andd try the evasi0n jailbreak. Appreciate your answer. there is no link for iphone 3 in here..
CDMA and GSM are different signals. Verizon and US Cellular use CDMA and Sprint, AT&T, T-Moble, etc, use GSM. “safari couldn’t download file” or something like that. help, please? Anyone know what version of Pangu I need for an Iphone4 to 7.1.2? I’ve tried multiple versions (1.1+) however it says that my phone is an iphone 3,2 and not supported. what is the right frimware for ipod 4 !?? How do you know which one is your iphone 4??? HELP!! !